Just got back from a fabulously relaxing two weeks in Spain in the gentle surroundings of Mijas Pueblo in the hills of southern Andalucia. This photo, taken at one of my favourite restaurants – Bar Parasol – sums up how I felt! 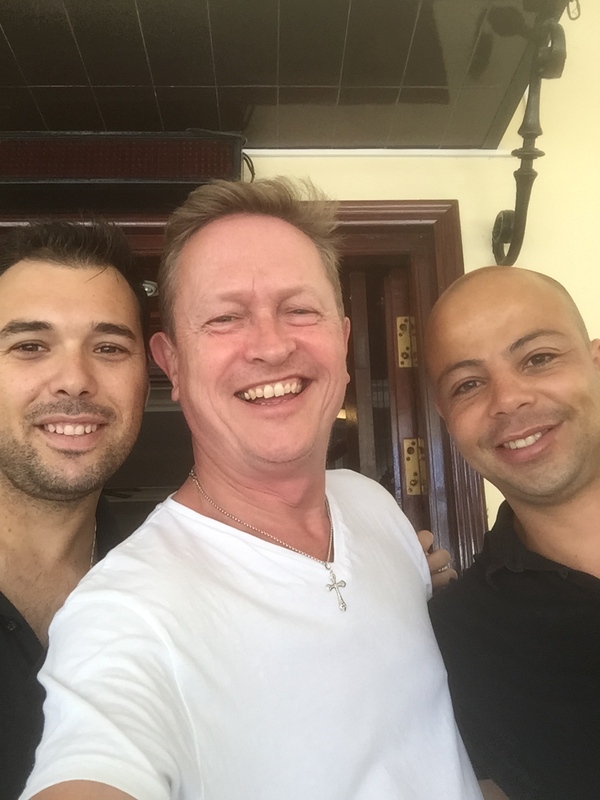 These two guys, Victor and JavI, were waiters there and they were so kind to me and my family. Few English venture to this restaurant, which is at the far end of Fuengirola, in a quiet back street, and it meant we got to sample real Spanish food with real Spaniards. I recommend it highly! Anyway, this is more of a pictorial record of some of the food we ate, with a recipe or two along the way. So, here goes. This is one restaurants take on the classic ensaladilla rusa. The base was creamed cold mashed potatoes mixed with chopped boiled egg, chives, and mayo. 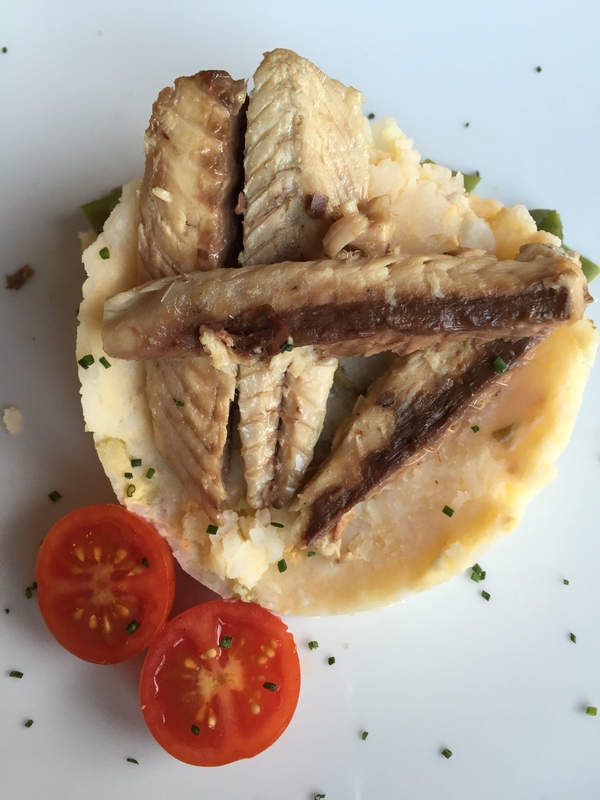 Then it was topped with fillets of fresh mackerel. A truly flavoursome starter. 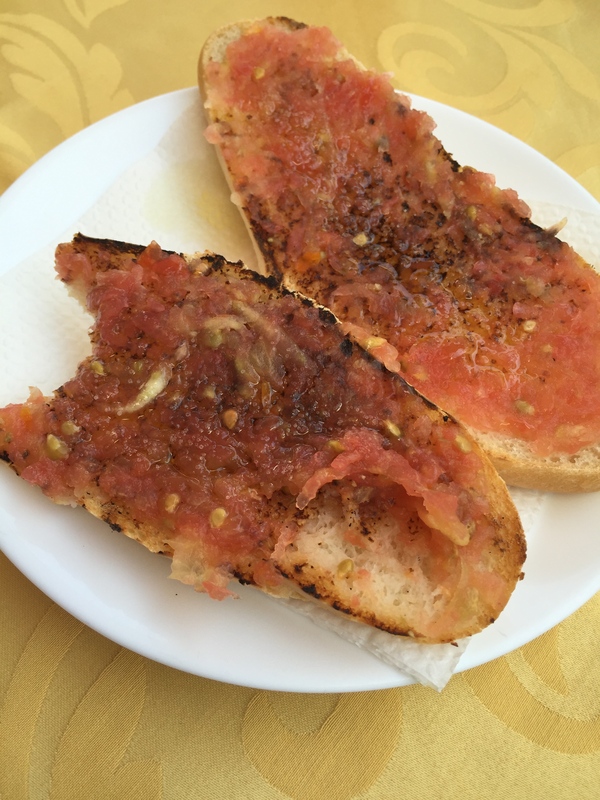 Most mornings I started the day with tostados – toasted bread rolls topped wither with finely chopped tomatoes, or simply with olive oil and a little salt. Always accompanied by a glass of freshly squeezed orange juice and a café con leche. Obligatory! 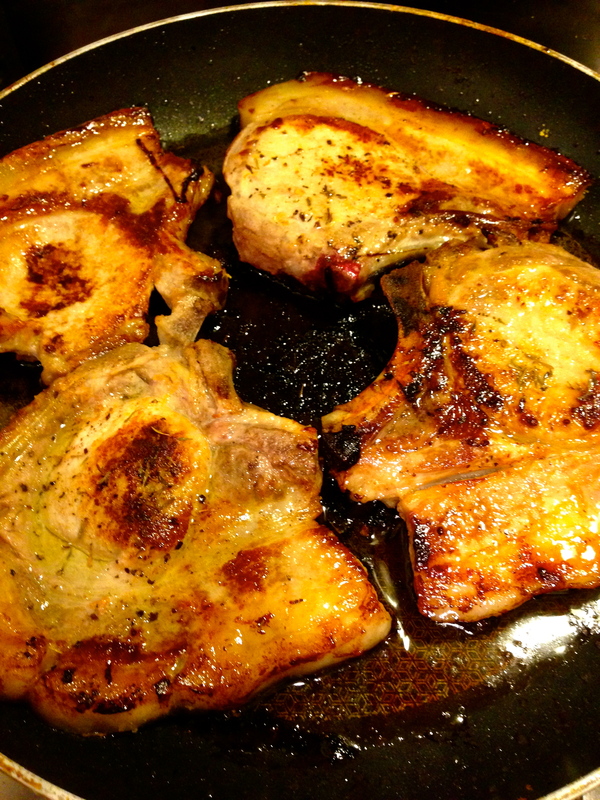 Pimientos pan fried were an almost ever present at supper – I adore them. 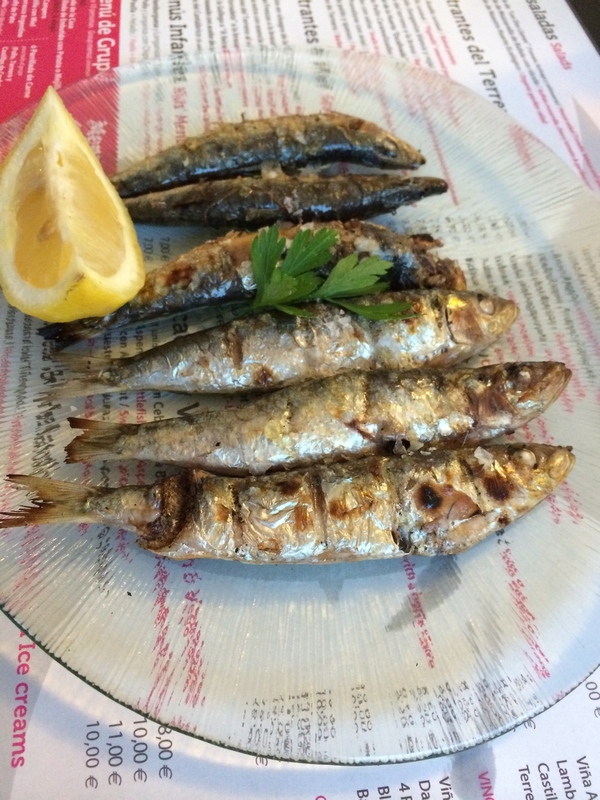 We ate lots and lots of fish – these freshly caught sardines were so succulent cooked a la plancha, and we also had plates of pan fried anchovies too, which were very meaty. In some places they were barbecued on long sticks over slowly smoking wood chips. The smell was divine! 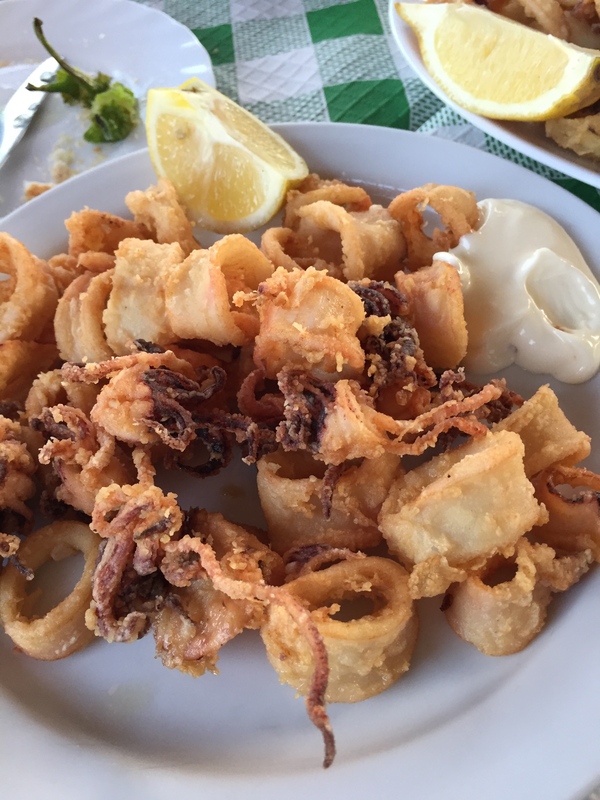 Lots of restaurants pride themselves on their mixed fried fish plate – this one immediately above – had bacalao, squid, octopus, baby squid and hake. This was a ración, a larger version of a tapa..and very filling! This was only 5 euros – about £3. Crazy. 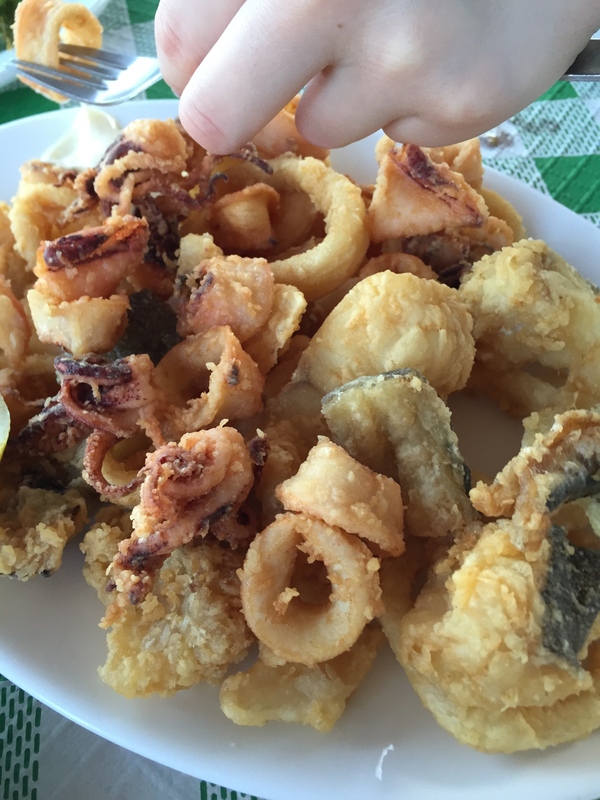 The picture above that is of a mix of chipirones – tiny squid and calamari. 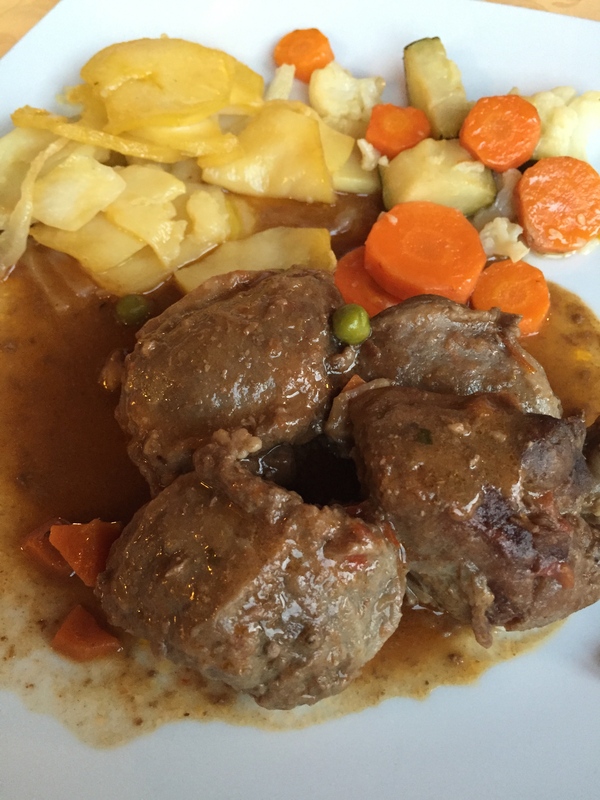 This dish was one of the tastes of the fortnight – Iberican Slow Cooked Pork Cheeks – click the link for a great version of this recipe! Egg, bacon and chips? 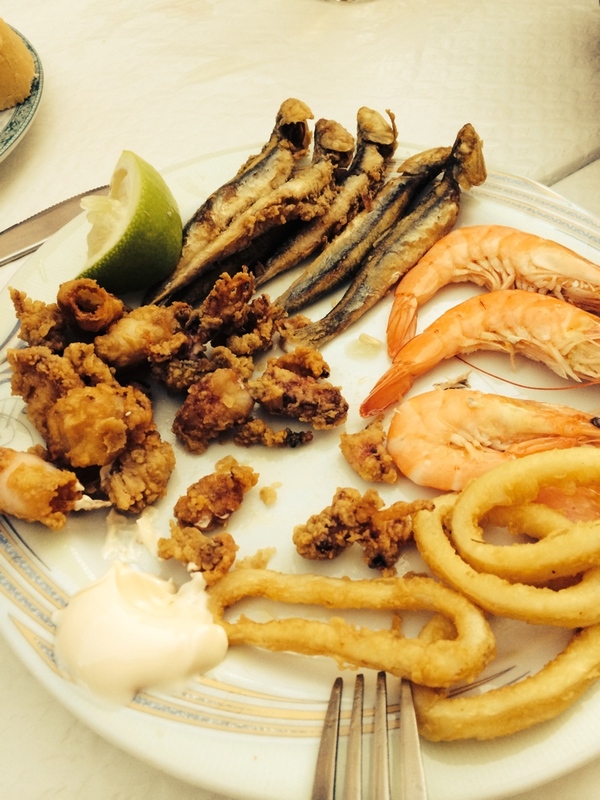 In Spain, believe me, this is a much tastier take on an English staple supper. 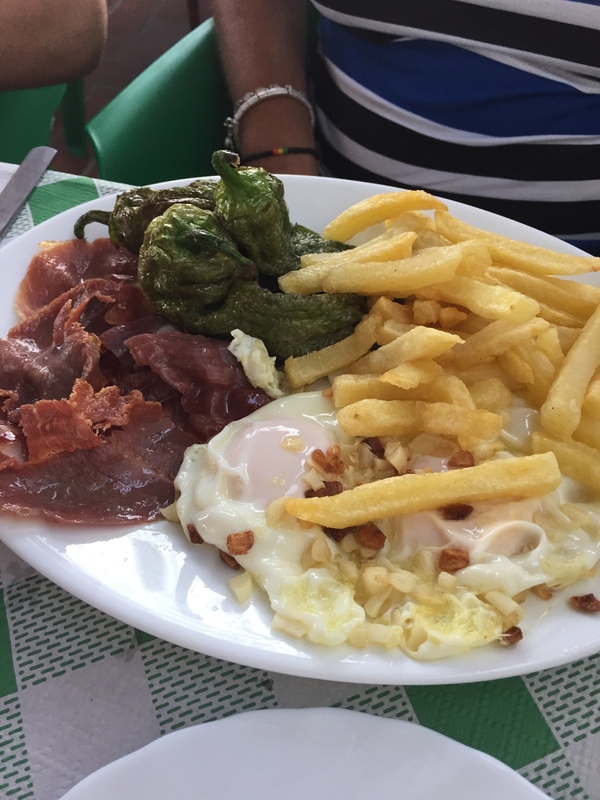 Here, the eggs are gently fried with garlic and served with quickly pan fried, thickly sliced Serrano ham and succulent pimientos. 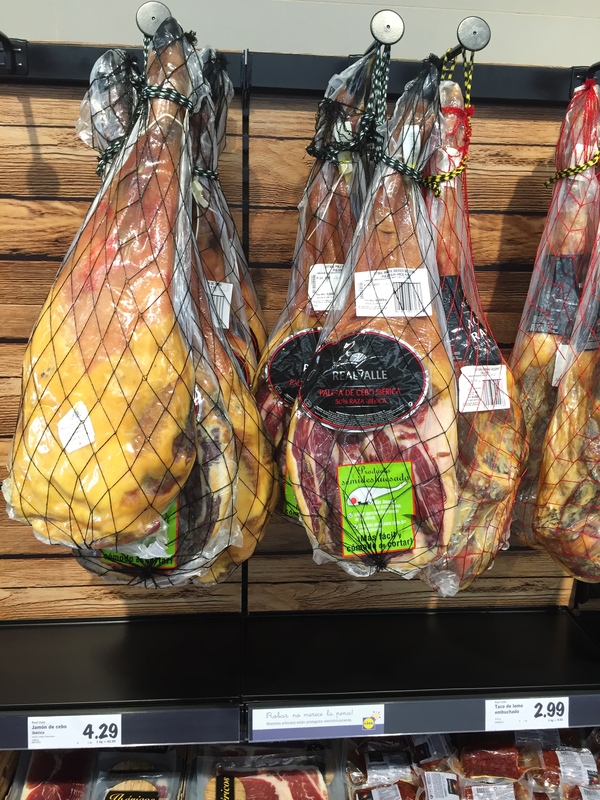 The choice of ham everywhere is remarkable – this, believe it or not, was in a Lidl in Mijas. The counter was about 20 foot long, full of every kind of ham and morcilla you could wish for. 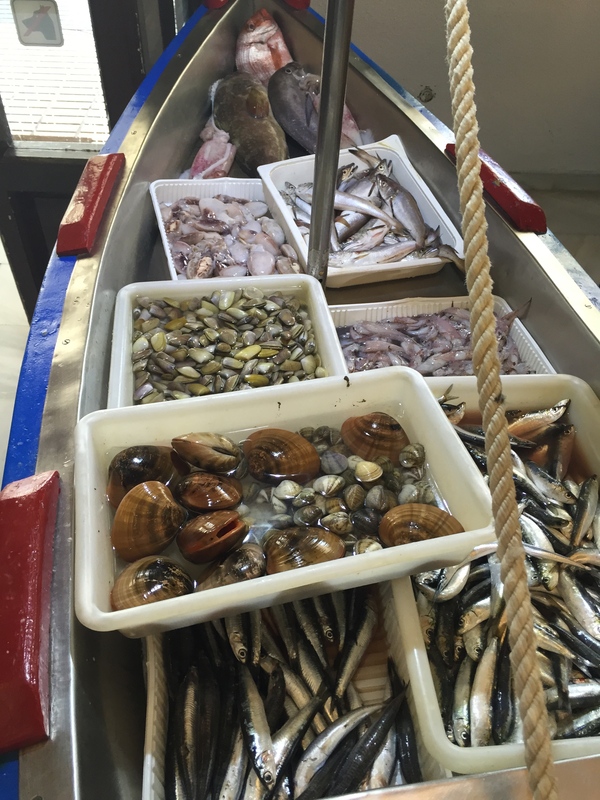 Back to Bar Parasol, this was where you chose your fish fish each day for lunch – sardines, anchovies, squid, hake, red snapper, clams and baby clams – almejas – were on offer this day, but it frequently changed delineating on the catch that morning. What a life! To be able to eat like this every day! 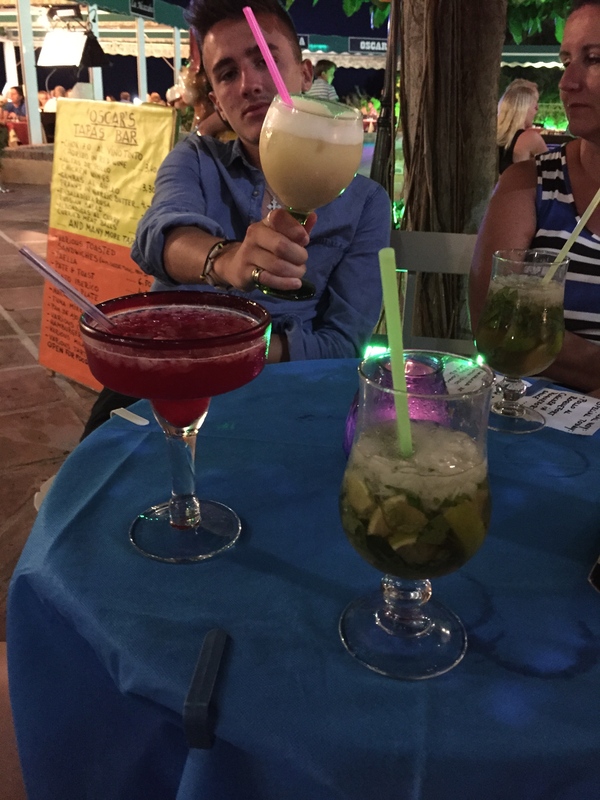 And as often as we could we ended our nights with a cocktail at Oscar’s Tapas Bar in the centre of Mijas. Wonderful owners and again, highly recommended if you ever visit Mijas. 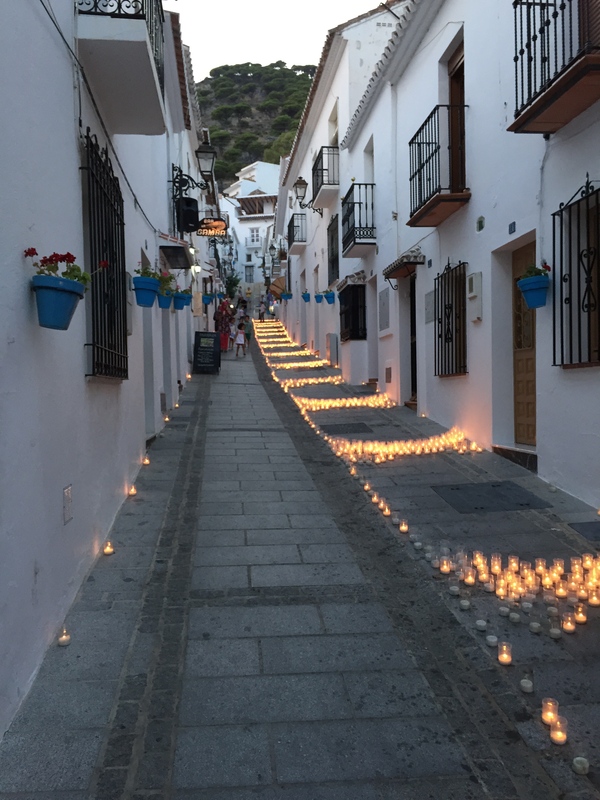 On our last night there it was the Luna Mora festival – the Moon of the Moors, and the whole town was lit up by candles. Magical. More to follow soon – including a recipe for one of my favourite cold summer soups! And it’s not Gazpacho! This is such a sensational supper dish and simplicity itself. 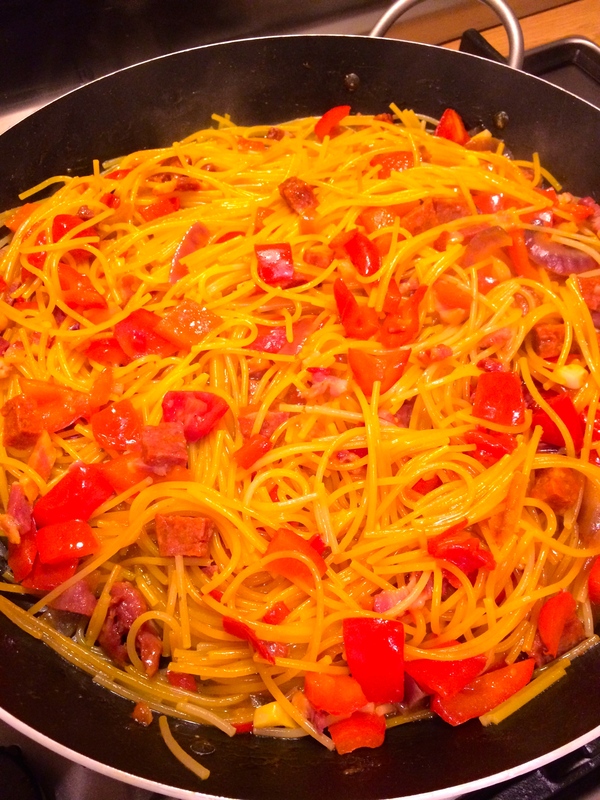 It is a sort of paella but with broken spaghetti instead of rice. 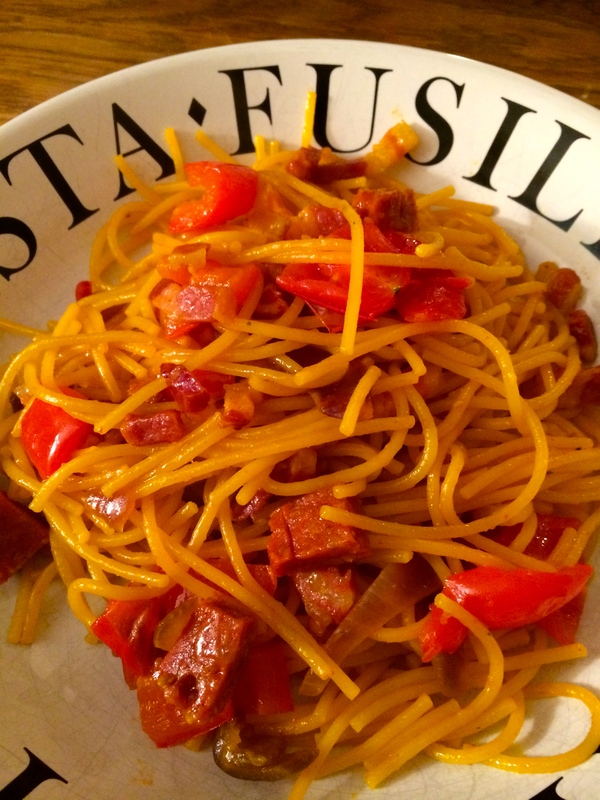 Fideuà is a Valencian word, in Catalan it is Fideuada – from fideu, Catalan / Valencian for “noodle” – and it is a dish typical of the Valencian region of Spain. It originated in the 1920s in the city of Gandia (close to where we were on holiday this year – a very beautiful small coastal resort on the Costa Azahar) when thin noodles like vermicelli were used instead of rice in the popular dish paella. 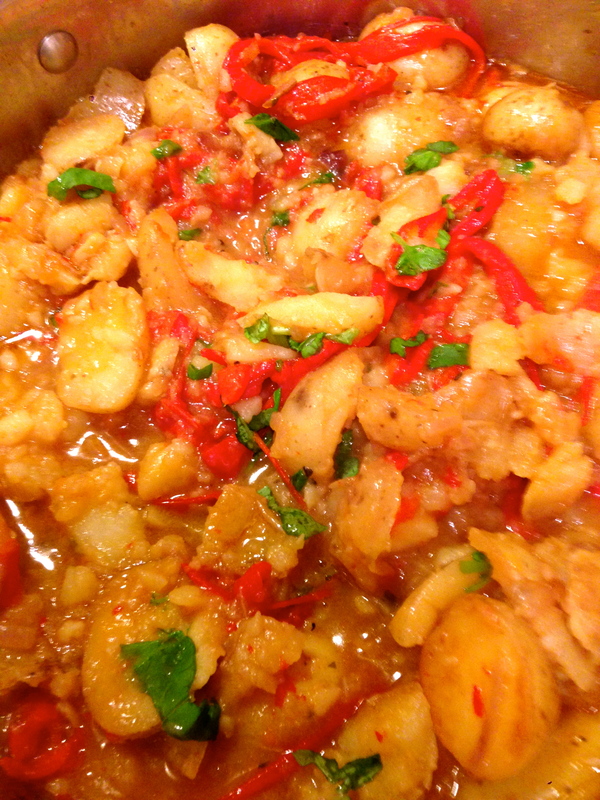 It can have all the usual culprits; chicken, prawns, rabbit etc but, like all great peasant dishes, it is perfect too for using leftovers, or as a make do dish from what you have in your store cupboard and fridge. So, this is my version tonight! I went for a red motif! I had san marzano tomatoes, red pepper, a red chilli and chorizo in the fridge so, along with 400 gm of dry spaghetti lingering in my pasta pot – fideuà it was. I pan fried a sliced red onion, a deseeded and sliced red pepper and 3 cloves of finely chopped garlic in olive oil in one of my smaller paella pans for about ten minutes. But you could easily use a large frying pan or a sauté pan. Then I added 100 gm of lardons and about 50 gm of chorizo sausage cut into small cubes, a finely chopped and deseeded red chilli and 6 san marzano toms quartered. I cooked this mix for a further ten minutes or so, added a sprinkle of smoked paprika, then a glass of white wine – about 125 ml. Once the wine had reduced a little I added 500 ml of hot chicken stock. I fiddled with my Spotify tracks for a moment on my i phone, and then when the mix was all bubbling pleasantly I added 400 gm of broken up spaghetti. You need then to gently coax the mixture round the pan for about 20 minutes until the spaghetti is al dente – you may need to add a little hot water along the way to keep it moist. About 5 minutes from the end I stirred in a little saffron to give it a golden edge. The resultant dish was remarkable and delicious in the extreme. My two teenage children were wowed – and they do not wow easily! 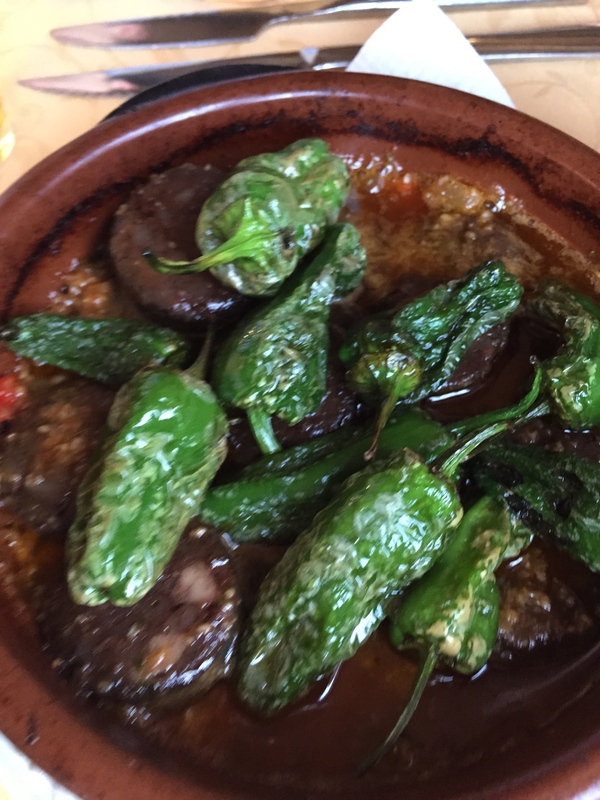 These beauties known as pimientos de Padrón in Spanish are one of my favourite tapas. They are so simple to prepare and have a wonderful fresh earthy flavour and, now and then, – they say 1 in 30 – one has quite a chilli kick! Whether a given pepper ends up being hot or mild apparently depends on the amount of water and sunlight it receives during its growth. 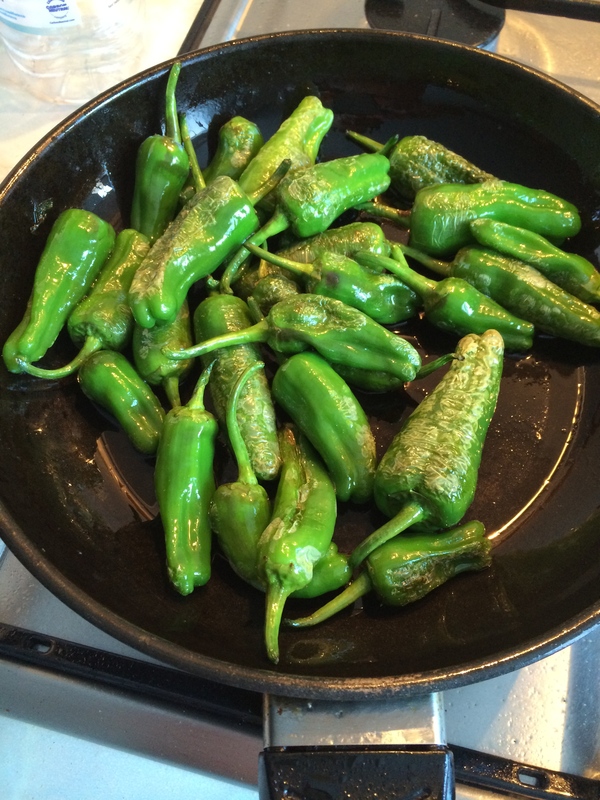 They are fun to eat and my family looks on it as a kind of tapas roulette – who will get the fiery pepper! 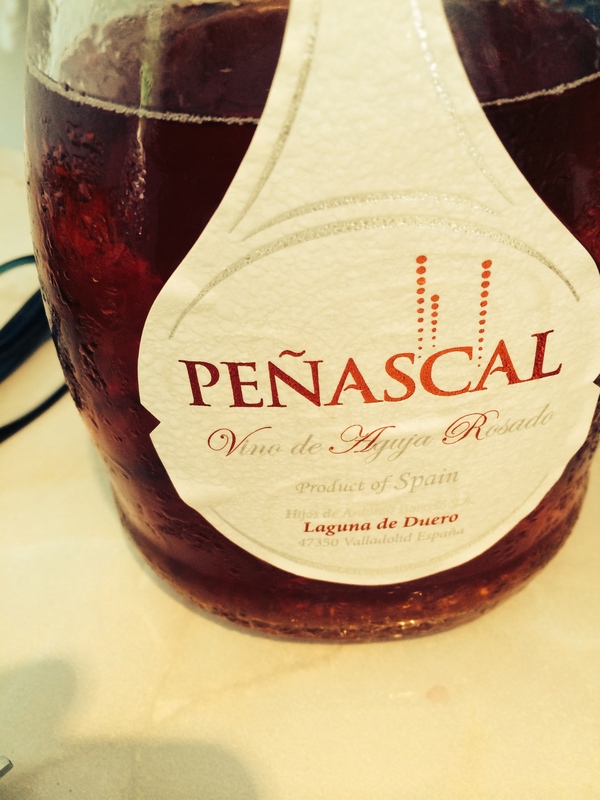 They originate from Galicia in North West Spain, in actual fact from Padrón near La Coruna – hence the name. The peppers are picked while their size is still small, starting as soon as mid-May. 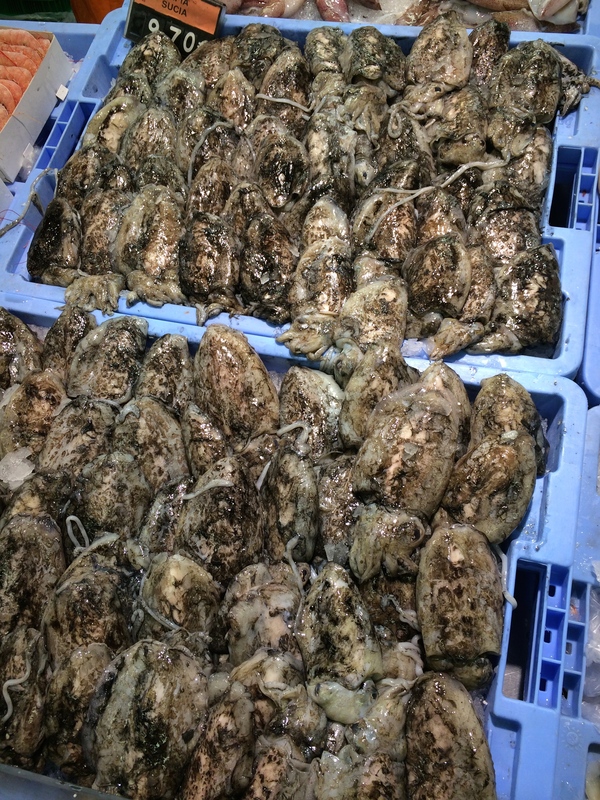 Traditionally, they were sold in the period going from late May until late October or, on occasion, even early November. However, the introduction of greenhouse plantations has made them available throughout the year. e get ours from a local market but Waitrose often sell them too. You can order them on line as well. All you need to do is take your peppers and wash and dry them. 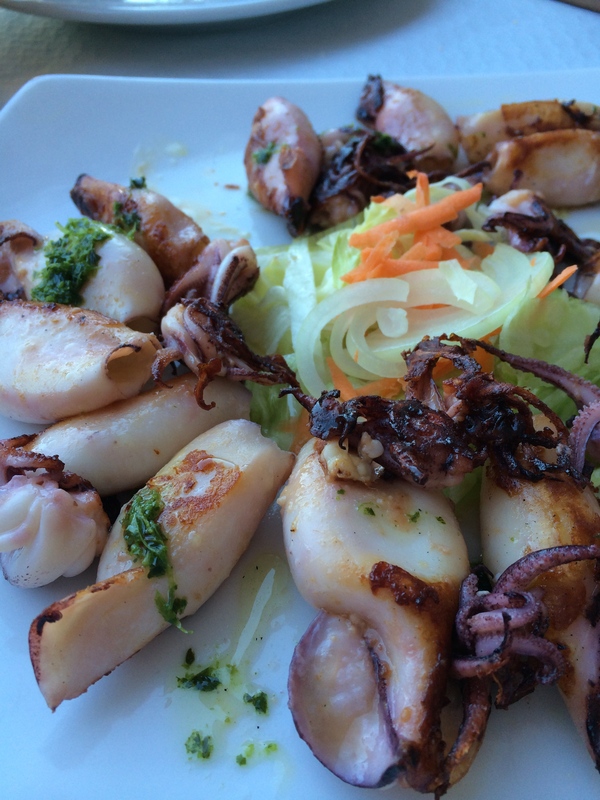 I reckon about 8 each is a good number for a tapas – but it is up to you! Pop some olive oil in a frying pan and get it hot. Add the peppers to the pan and fry gently until they start to blister and brown slightly. About three minutes or so usually. 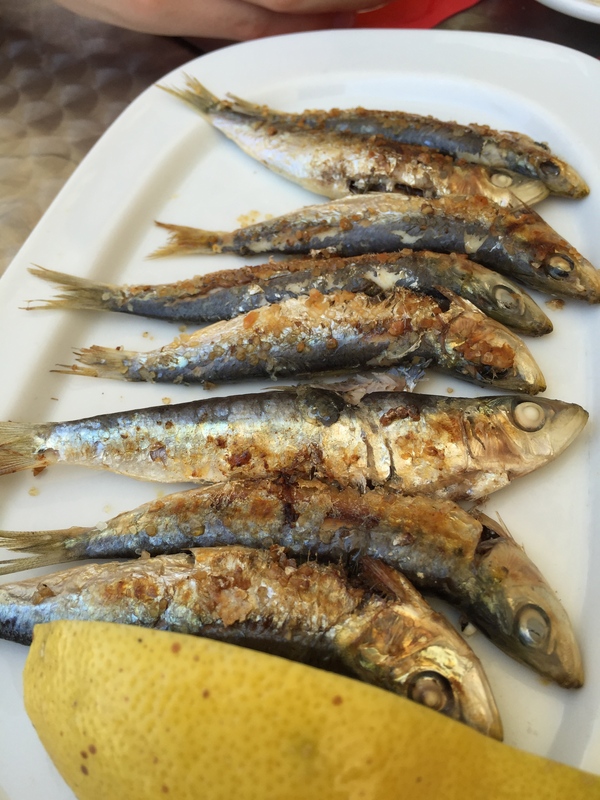 Sprinkle them with rock salt and serve immediately – great with a nice glass of ice cold beer, a cold dry sherry or a cold crisp dry white wine. Eat it all down to the stalk! A friend of ours calls these ‘Pardon me peppers’ – if you eat too many – you will no doubt discover why !! As a rather grey gloom descends over my part of Hampshire recalling my recent trip to Spain brings back wonderful feelings but also a little sadness that it is over! The food was fabulous and we met so many wonderful restauranteurs and waiters. 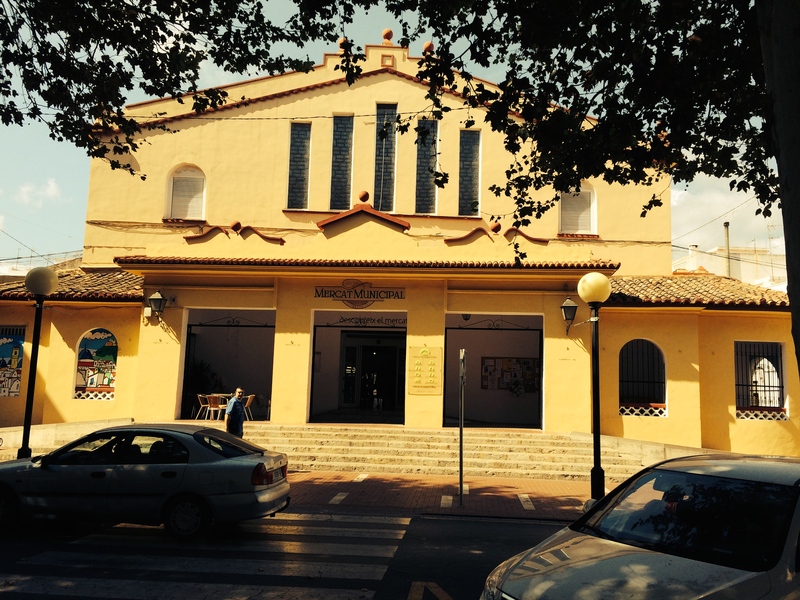 The people of Oliva are serenely calm folk and their way of life is incredibly enviable. It was so cheap too. I could not believe it. 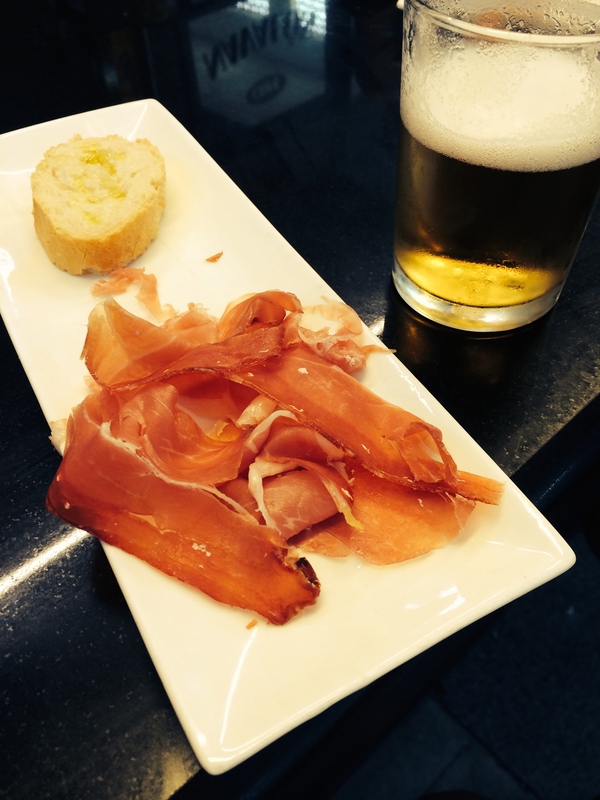 A beer and a tapa of jamon and bread with olive oil for example was a crazy 1 euro 50…. This jamon was actually from Aragon – I bought 100gm straight afterwards for just 3 euros…mmmmm….!!! The fish was delectable and we ate a lot. Anyway, here is a montage of shots of food and life where we stayed. 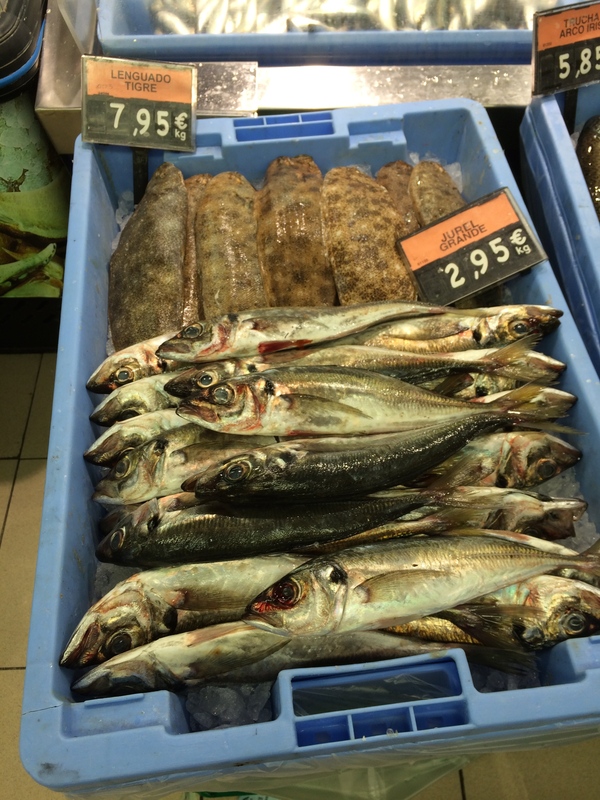 First day shopping at the local supermarket -Mercadona – I could live in this shop!! 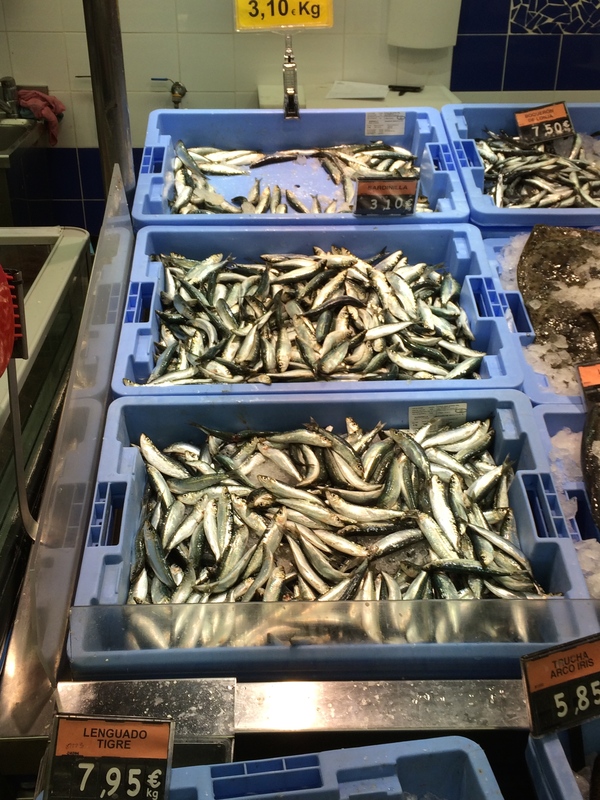 – 5 -yes, 5 ladies on the fish counter alone! Our local supermarket here struggles to provide one! 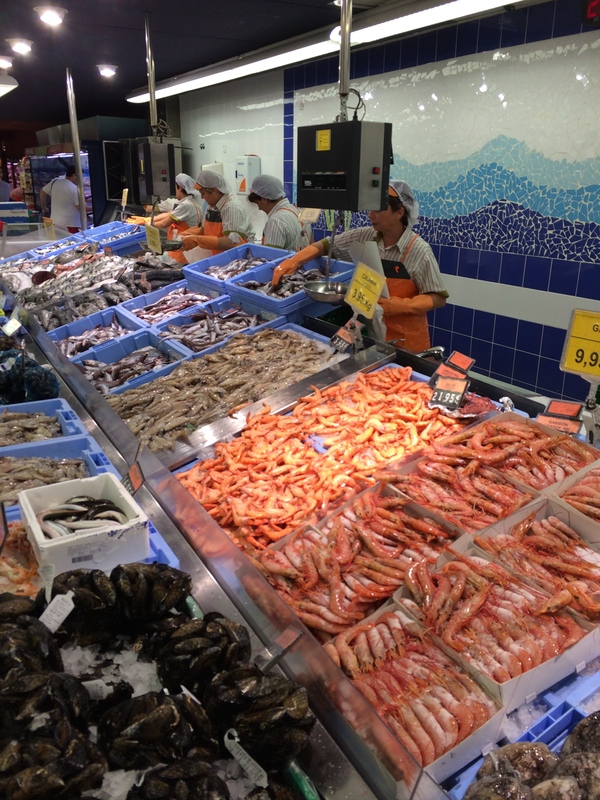 And this is about 4 times the size of my local fish counter – and we are an island!! 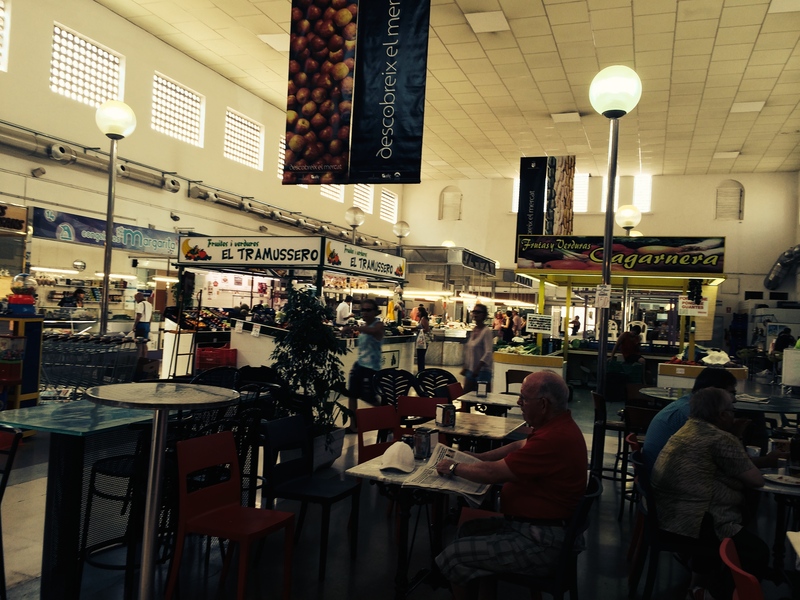 And this was the indoor market – air conditioned and packed with amazing meat, fish and veg stalls as well as 2 great tapas bars. Click on the next picture to get the full panorama of this haven…. 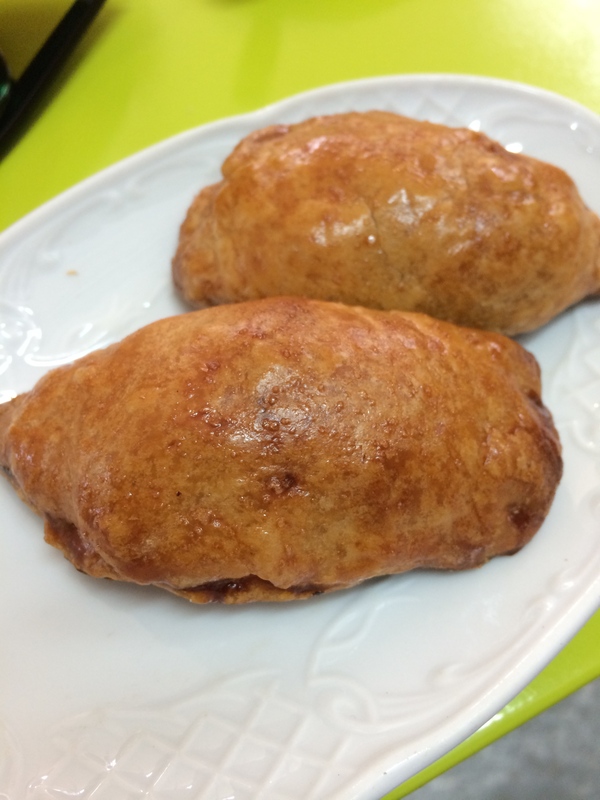 A real favourite of mine was the exquisite empanadas in the tapas bars…one here is filled with morcilla and the other with spinach and tomato. 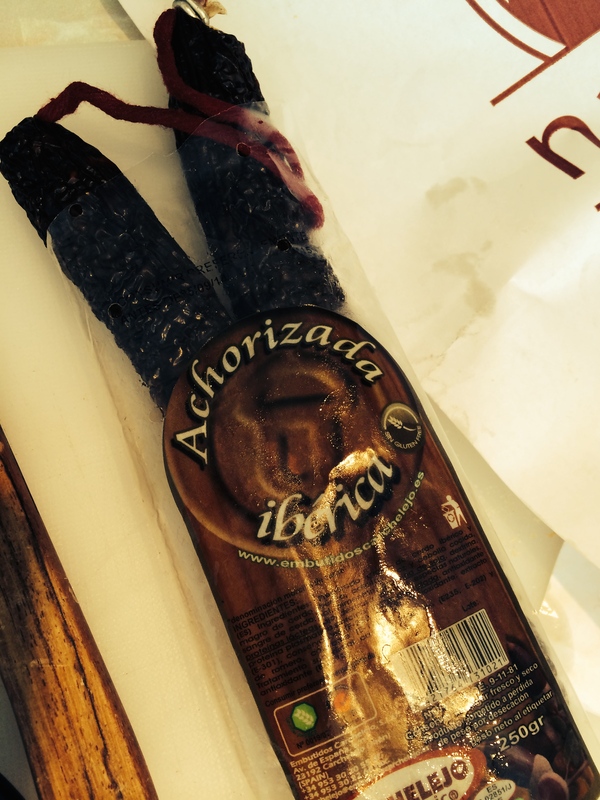 I came across this too – never had it before – a mix of chorizo and morcilla – rich and succulent and a perfect accompaniment to a cold beer! 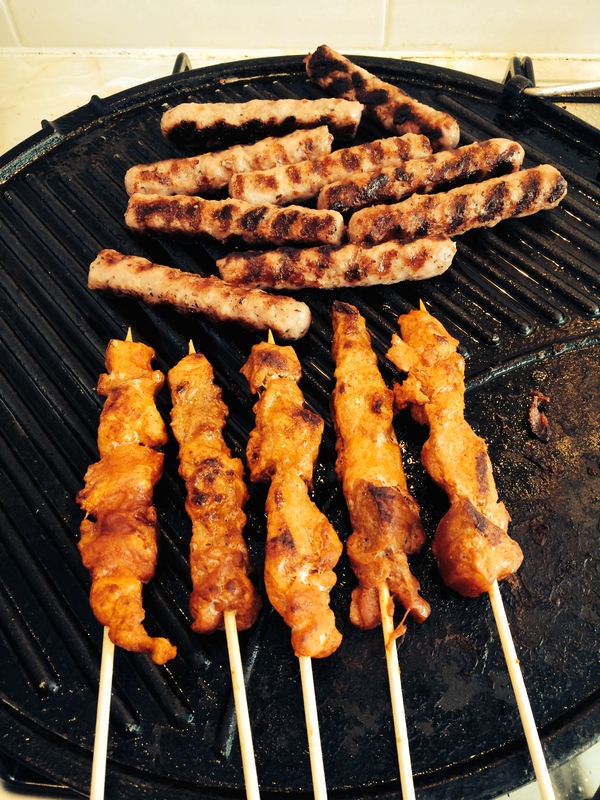 My kids loved me making patatas braves for lunch by the pool…with a variety of meats cooked a la plancha…. 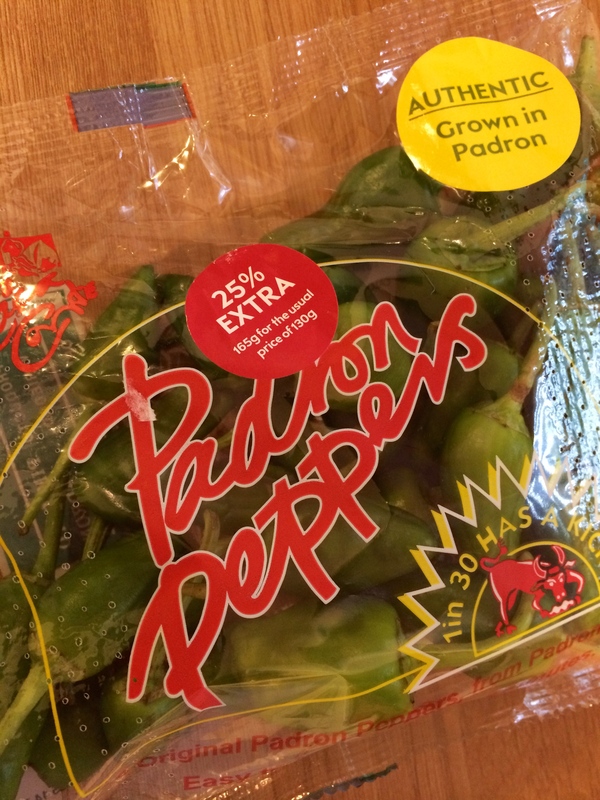 .…and we all adore the pimentos padrón. 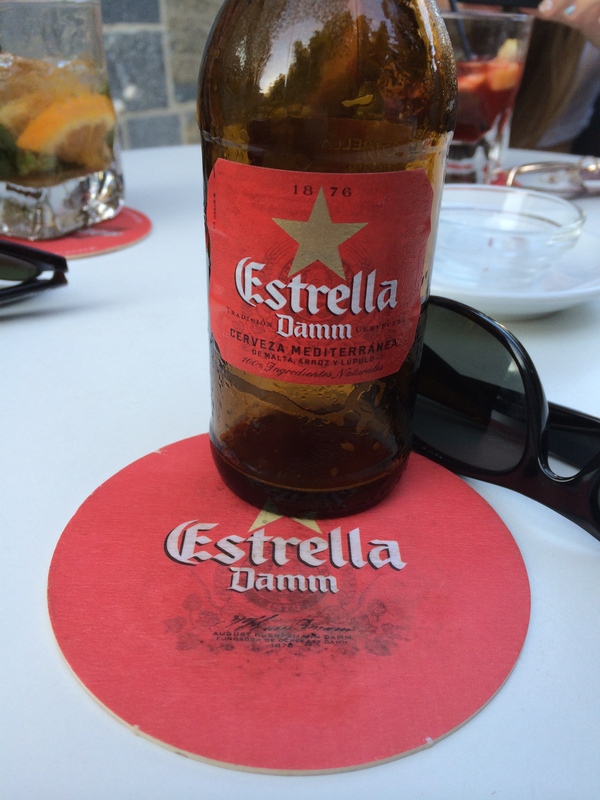 All washed down with a variety of beverages from ice cold rosé…to cava…to one of my favourite beers…Estrella from Barcelona…as well as mojitos, martinis and dessert wines! 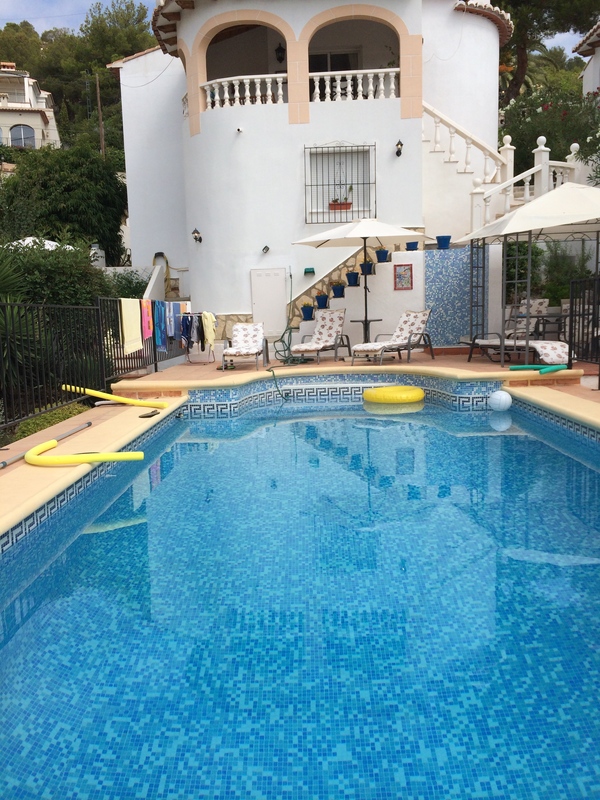 And as well as all the fabulous array of food…I will miss my pool! Well, I had an amazing one at a truly wonderful restaurant called Ca Fran…but that meal and restaurant deserves a post of its own…so hang fire…it is on its way! Fire in my hand…a montage of my food…. Just an experiment! It is a 1st attempt! Nothing more! Tonight I stared into the abyss that is the end of the week cupboard…staring back at me were 6 free range eggs and a jar of cornichons. Ok….let’s flip the fridge open…..8 slices of prosciutto. Hmmm….in the veg rack were several potatoes minding their own business and 4 shallots snoozing softly. Nothing to be done other than a dish redolent of Spanish nights, aimed solely at dispelling the rusting rainy weather engulfing my corner of the globe presently. Tortilla. 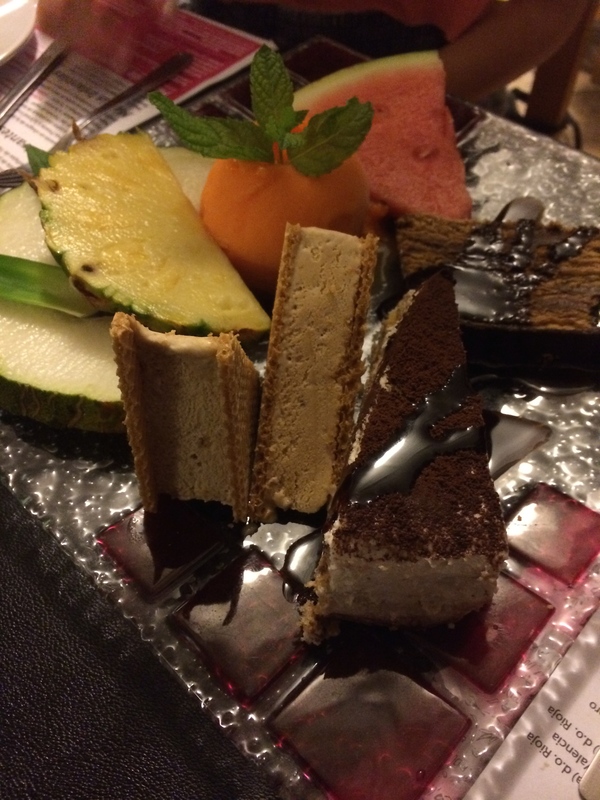 Paradise on a plate. 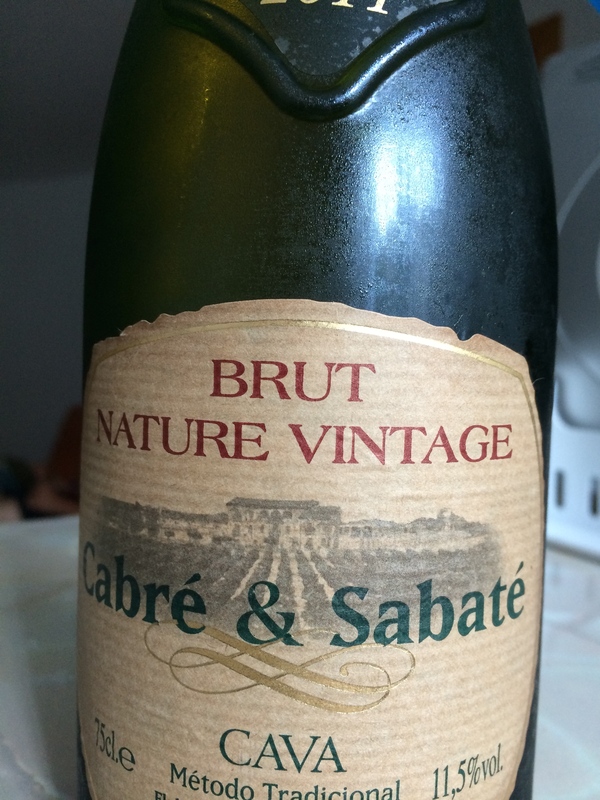 So, I poured a glass of finest Spanish Cava to set me on the right path and began peeling and slicing. I even popped Mana on the sound system. This simple piece of bliss was around 6 spuds peeled, halved and sliced. 4 shallots peeled and chopped. A frying pan coated with plenty of olive oil, heated then add the pots and shallots. Coax around the pan until starting to brown a little – about 15 to 20 minutes on a lowish to medium heat. I was a bit cheeky tonight because I also added a finely sliced green birdseye chilli. I then beat 6 free range eggs with plenty of black pepper and some ground sea salt – added this to the pan and let it drift into every nook and cranny. Another five minutes then place the frying pan under a hot grill until the egg is setting and browning. Remove. Place a platter over, pray and flip! I served it with the prosciutto, cornichon and some fennel salami. I also has some warm crusty ciabatta and mixed green salad on the side. 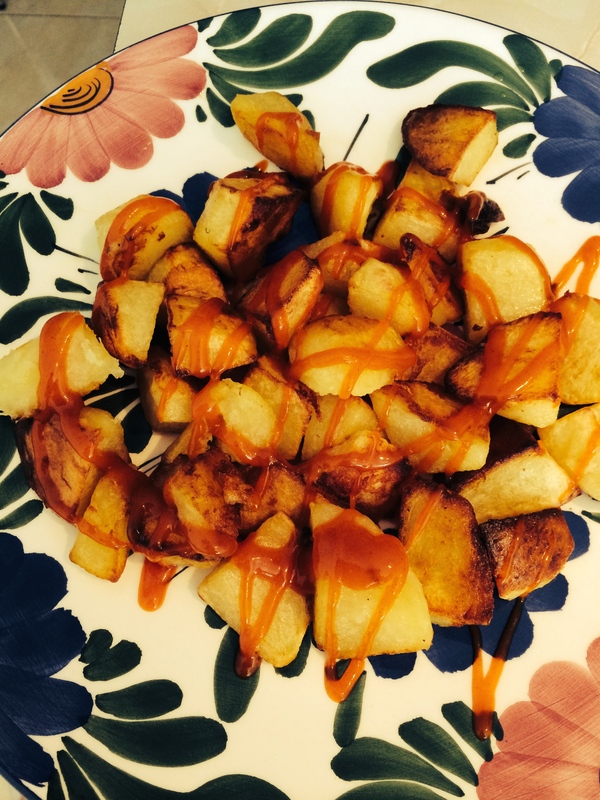 This is a take on the famous Spanish dish of patatas a lo pobre – it is wondrous in its simplicity yet divine in its complexity of flavours. There is little like it – I could easily eat it on its own – or it could just as easily accompany anything from lamb to fish. 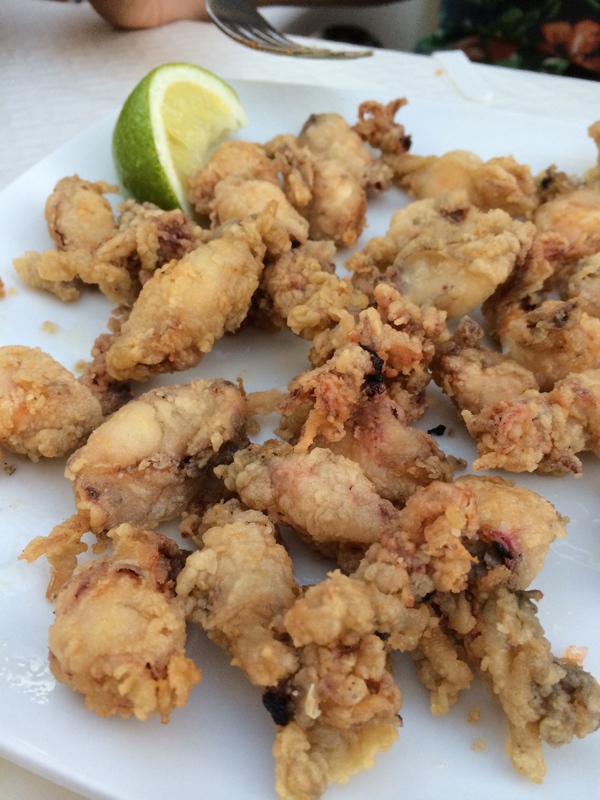 I ate it in Menorca last August snuggling up to a snow white slice of monkfish and it was delectable – I swear I can still taste it when I close my eyes. That version was with green peppers. 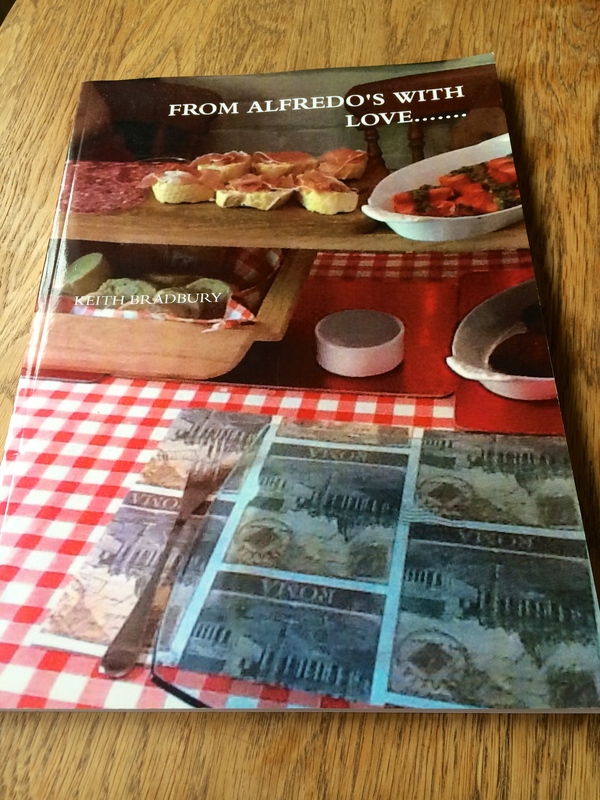 This one is based on Nigel Slater’s version from ‘Eat’. Heat oil in a sauté pan. Place pots in cut side down with the chilli. Leave them for about 5 or 10 minutes while you deal with the peppers. Add them to the pan, then the onion and garlic. Then the paprika. Pop in the butter and stir until all get coated nicely. Leave again for about 10 to 15 minutes to get the potatoes browning in that very attractive fashion they have. Have a drink. Then pour in the stock, bring to the boil, season a little. Cover with a lid and simmer for around 20 to 30 minutes until the stock has evaporated down a lot. I took the lid off for the last five minutes and crushed most of the potatoes ever so lightly with a masher to soak up the magical juice. Stir in the basil at the end. 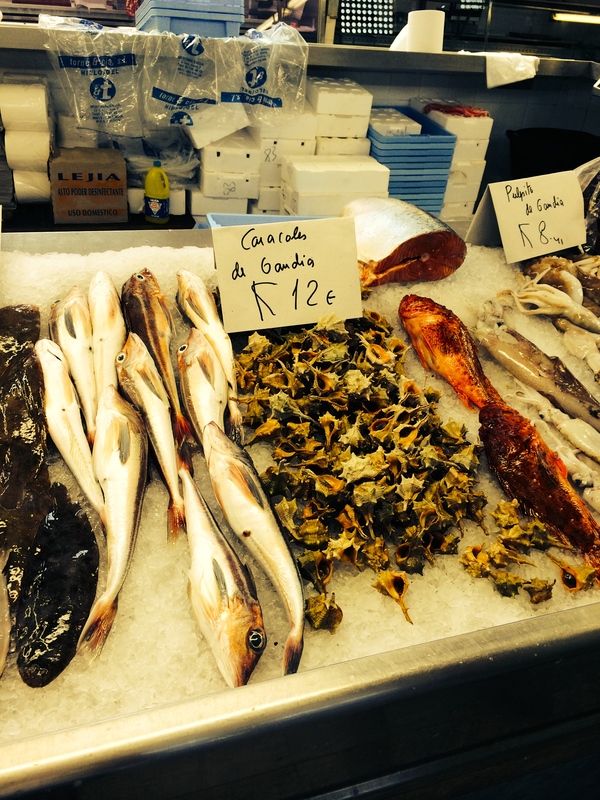 I served this alongside a loin chop pan fried slowly in a little olive oil. Half way through cooking I grated over the zest of a lemon and sprinkled lots of thyme and black pepper. 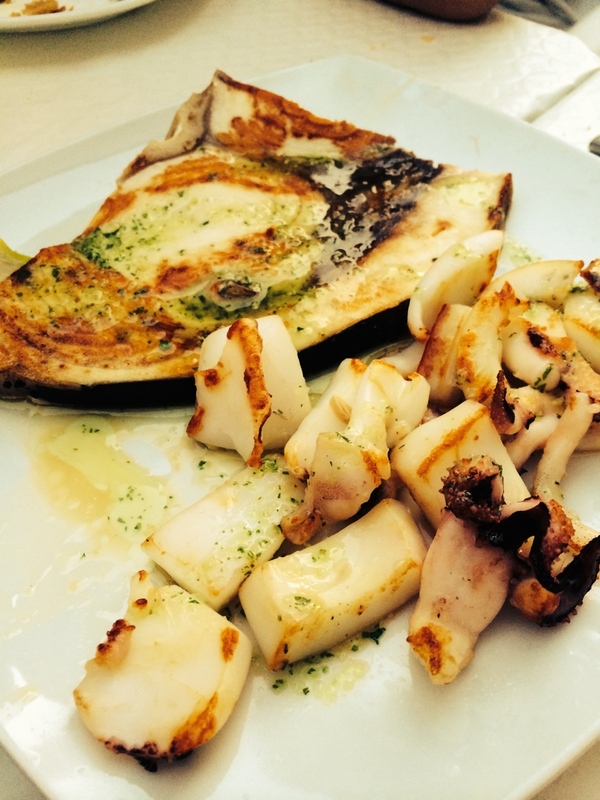 The resulting meal was one of those I simply wanted to prolong as much as possible – the flavours were straight from heaven – a Spanish heaven in this case – somewhere possibly just outside Granada or Zaragoza. This is the grandaddy of the versions – but you could just do it with the spuds, onions, pepper and stock with a little seasoning. If you have never tried this I urge you to. Soon.